The European country is cooperating with Meituan Travel to promote its cuisine to lure more Chinese visitors. 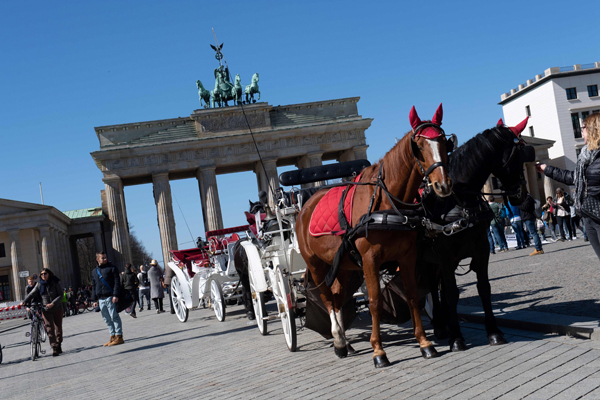 Germany knows travel is largely a matter of taste-in every sense. The German National Tourist Board recently announced its strategic cooperation with Meituan Travel to promote German cuisine among Chinese travelers. "We'll make the most of our resources to recommend authentic German food and drinks to Chinese through online and offline events," says He Sheng, who's in charge of Meituan Travel's overseas-holiday business. The agency is owned by Meituan-Dianping, one of China's largest providers of on-demand online services. Meituan Travel covers more than 185,000 restaurants, shops and scenic spots in Germany. Major Chinese online food-service company Dianping is hosting a series of German-food events through November. Chinese users can browse websites exclusively dedicated to German cuisine and use Dianping to make reservations at some restaurants in Germany. Data show outbound Chinese travelers often use Dianping to check information about overseas destinations before and during travel. The most searched German cities on the app are Frankfurt, Munich and Berlin. "Germany offers more than ham sausages, schweinshaxe (roasted pork knuckle) and beer," director of the GNTB's Beijing office Li Zhaohui says. "This year, the GNTB is promoting 'culinary Germany'-themed tours that combine delicious food with beautiful scenery and cultural heritage. Germany hosts over 300 Michelin-starred restaurants and 1,300 breweries, and produces about 3,200 kinds of bread. Chinese gourmands will love its culinary experiences." Tourists can join food festivals and sample regional cuisine, such as fish and clams in the coastal areas and cheese in the Alpine Allgaeu region. Saxony is celebrated for its food, wines and art. Traditional dishes include sauerbraten, a German pot roast, and leipziger allerlei, a vegetable dish said to originate from Leipzig city made with peas, carrots, asparagus, morels and crayfish. Germany has 13 wine regions. This year, the GNTB has cooperated with the German Wine Institute to develop wine-trail itineraries. Chinese visitors can walk or cycle along the routes to visit vineyards and wineries, and enjoy the sceneries and attractions. Open-air wine festivals offer opportunities to enjoy wines and snacks, mix with locals, and enjoy parades and dancing.